Veterinary Anesthetic and Monitoring Equipment is the first veterinary-specific resource solely dedicated to anesthetic and monitoring equipment used in clinical practice. This illustrated patient-side guide focuses on general principles applicable to any brand of equipment, highlighting some newer technologies, and includes practical troubleshooting tips and tricks. The book helps clinicians to understand their equipment’s functionality and to solve problems encountered in daily practice. Emphasizing clinical applications, Veterinary Anesthetic and Monitoring Equipment covers gas supply and distribution, anesthesia machines, breathing systems, airway equipment, monitoring equipment, equipment in different environments, and equipment care. A section on unique species considerations includes dedicated chapters on dogs and cats, ruminants, horses, swine, birds, rabbits, rodents, fish and amphibians, reptiles, and primates. 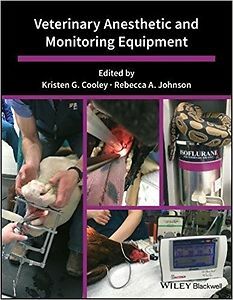 Veterinary Anesthetic and Monitoring Equipment is an essential reference for any veterinary clinician performing anesthesia, including veterinary specialists, clinicians, and veterinary technicians.